Join Us For Our January 26th ‘Meet The Expert’ Lunch! Questions about long-term care? Come join us for lunch on Thursday, January 26 at our offices and ‘Meet the Expert’. 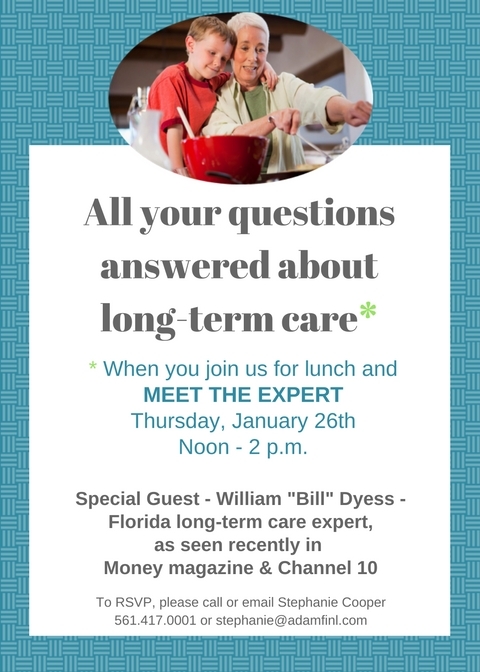 Our guest will be William “Bill” Dyess, one of South Florida’s most experienced long-term care experts, who is a fellow member of the South Florida Financial Planning Association. This is a great opportunity to learn more about strategies for meeting your long-term care needs and evaluating what’s available in the long-term care marketplace. Whether you’re just starting to explore your options or already have a plan in place, you’re certain to pick up some new and interesting insights.